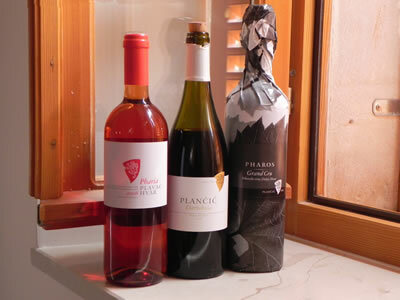 Visited the Plančić winery in Vrbanj yesterday in search of a bottle of their wonderful Pharos Grand Cru. We had tasted it at the Dalmatian Wine Expo in May, and have wanted a bottle all to ourselves ever since! So, seeing the lovely new sign on the Stari Grad – Jelsa road for “Plančić Winery ~ Tasting and Sales” we headed up there. Knowing the local custom, we had actually tried to call ahead, using the phone number on their website, but found ourselves listening to the fax machine! The roadside notice, of course, didn’t offer a contact number. We arrived to find the guys on a break, surrounded by crates of grapes ready for crushing. Very happy to give us a tasting tour he said, but if we’d called ahead they could have had something better organized for us! And if we like to come back next week we can try the newly pressed must. 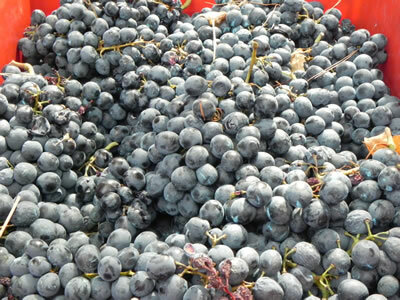 Darnekuša is a grape varietal indigenous to the island of Hvar, and usually only appears in blends with Plavac Mali. 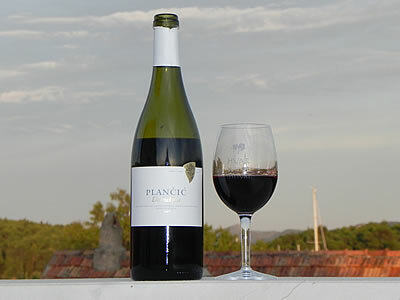 However, every few years, when it’s deemed good enough, Plančić bottles a single varietal Darnekuša wine. The last time was in 2007, and they expect this year will also be a good year. The grapes are grown in Vrh, a small plain near the peak of Sv. Nikola, the island’s highest mountain. In fact, Plančić believes this to be the highest vineyard in Croatia. 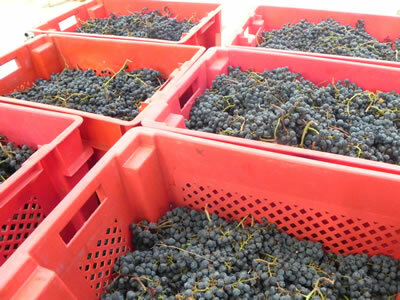 Recently harvested, this year’s grapes look very black, and taste extremely sweet. The wine will sit in oak barriques for 12 months before bottling. Not surprisingly, Darnekuša wine is so deep a red as to be almost black, with a nose of plums, blackcurrants and minerals. It tastes of red fruit combined with rocks and aromatic herbs, rosemary. Strong tannins, a bit like chewing an aromatic branch of wood, pine, perhaps? At 14.3%, this is a strong, full-bodied red in the southern European tradition that carries the essence of the island. It went really well with a plate of cheese and sardine pate on the terrace at sunset. Definitely worth looking for! Our final tasting was the Pharos Grand Cru – the top of the range offering from Plančić. This is a very fine, complex Plavac with 20% Darnekuša, aged 18 months in barriques. I have no idea where it can be bought, other than following the signs to the winery in Vrbanj. It’s not even mentioned on their website that I can see. Anyway, we’re looking forward to enjoying a whole bottle now!